I’m excited to introduce you to my friend Gina Holmes. 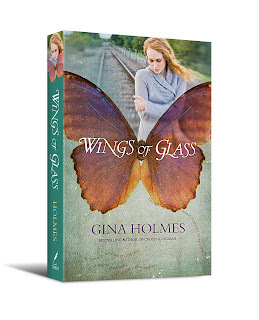 Gina writes contemporary fiction, and her novel, Wings of Glass, just released to rave reviews (including mine). I’m on the road this week, so I took her up on her offer to share her thoughts on her new release. 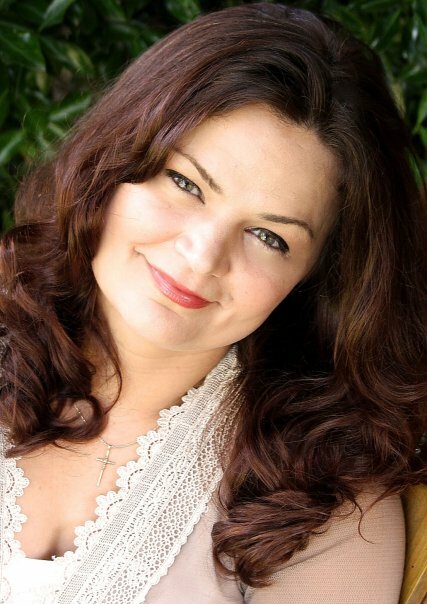 Gina Holmes is the founder of Novel Rocket and a PR professional. Her bestselling novels Crossing Oceans and Dry as Rain were both Christy finalists and won various literary awards. Her latest novel, Wings of Glass, released February 2013 and has earned a starred review from Library Journal, a Romantic Times Top Pick and a Southern Indie Bookseller’s Okra Pick. She holds degrees in science and nursing and currently resides with her family in southern Virginia. She works too hard, laughs too loud, and longs to see others heal from their past and discover their God-given purpose. To learn more about her, visit www.ginaholmes.com. Your 3rd novel, Wings of Glass, has just released. Tell us a little about it. As a little girl, I watched my mother being physically abused by her husband and then later, two of my sisters enter abusive relationship after abusive relationship and I thought that would never be me. . . until the day my boyfriend hit me for the first time and I began to make excuses for him. I know the mindset of someone who gets into and stays in an abusive relationship, because I’ve been there myself. It’s taken me years, and a lot of reading, praying, and talking to get to the heart of what brought me and kept me in toxic relationships and I want to pass on some of what I learned that helped me find boundaries and recovery from a codependent mindset and most of all healing. It’s my hope and prayer that those who are in abusive relationships will begin to see that the problem lies with them as much as with the abuser. That’s something I railed against when friends suggested it. I wasn’t the one with the problem! I was no doormat who enabled abuse or addiction… or was I? I also hope that those who have never understood the mindset of victims would better comprehend the intricacies of codependency and be better able to minister to these women and men. And of course I’d love it if young women would read this before they ever enter their first romantic relationship to have their eyes open to how abuse almost always progresses and be able to see the red flags early. Which of the characters in the novel is most like you and why? I absolutely love Fatimah. She had such a great sense of humor and didn’t care what anyone thought except those who really mattered. She was really quite self-actualized. She was so much fun to write and I actually find myself missing her presence. What’s your favorite and least favorite part about being a writer? Favorite: making my own schedule. I love when I’m feeling bad one day knowing that I don’t have to punch a clock. I can just take the day off and then work harder the next. Of course, there’s a lot of other things I love about writing, like allowing others to consider another point of view that may be far different from their own. Least favorite: There’s a joke that when you work for yourself you at least get to pick which eighteen hours of the day you want. That’s true. Working from home means I’m always at work. I work from about 7:30 am until about eight at night most days. Under deadline, it’s worse. Truly understanding how much the success of a book rides on the shoulders of the author is a blessing and a curse. Because I get that no one is more invested in the success of my books than me, I put in a LOT of time on the publicity/marketing end of things. It’s tiring but an investment that I think pays off in the long run. Never say never, but I doubt it. I had considered reworking some but having gone back and re-read them, I realized they weren’t published for good reason. They just didn’t work. Now, there is one story I’m resurrecting characters from for a story I should be writing next, but the plotline is completely different. I started out writing suspensel but as my reading tastes changed, so did my writing tastes. I don’t see myself doing suspense again any time soon. You’re known for your quirky characters, what inspires you to write these types into each book? Honestly, I’m a pretty quirky person. The older I get, the more I embrace those quirks. I think everyone is quirky really. As a student of human nature, I pick up on those and like to exaggerate them in my fiction. I also like to surround myself with quirky people. My husband is quirky, my kids are quirky and so are my friends. Often in life, especially when we’re young, we hate about ourselves what makes us different, when really those are the things we should be embracing. Different is interesting. Different is beautiful. If you could write anything and genre, marketing and reader expectations didn’t matter, what would you write? Speaking of quirky… I read a book a few years back that was so different that it made me want to try something like that. The book was a big-time bestseller, Jonathan Strange and Mr Norrell. What turned me on about that book were the characters. They were quirky to an extreme. In contemporary women’s fiction, I can get away with a certain amount of quirk. but I’m always having to play it down because it’s so over the top. In a fantasy, you can be as over the top as you dare. I’d love to play around with something like that one day and just let my freak flag fly! Will I? Probably not unless I use a penname. I realize readers have certain expectations and I wouldn’t want anyone to feel mislead. We’ll see. There’s lots in life I want to do but since I only get a hundred or so years (if I’m lucky), time won’t allow for every rabbit hole. There are those who have written about subjects that they were told no one wanted to read about and found success. It’s smart to figure out what others have done before you to make them successful, but alter the formula to suit your needs and passions. It’s okay to be different, in fact, I think great success and maybe even happiness depends upon it. And by all means, read Novel Rocket.com and leave comments. It helps not only encourage those authors who have taken the time out of their day to teach us, but it also connects you to the writing community. Community is important. Any questions or comments for Gina? Thanks for this, Susan and Gina! Since you talked about quirks I’ll throw out my favorite quirky question: if you could be any inanimate object, what would you be and why? wow, that IS a quirky question. I wouldn’t want to be any inanimate object but if I HAVE to choose, water. It’s life giving. Thank you, Gina! Love your advice for writers as to not follow too closely to others. I know that comparison thing always trips me up. Blessings and thanks for sharing here at Susan’s! What a great and informative interview! This looks like a book I would enjoy. Thanks for sharing! Thanks so much. Why did I change from nursing to writing? I went into nursing because it was practical and I’m glad I did. It pays the bills when I need it to (writing is very unpredictable $wise.) I didn’t know I was a writer until after college. Once I got the bug for fiction, I was done for. I don’t have to nurse (at the moment) but love knowing I can if I need to. I love being a nurse too but the writing comes more naturally. Writing is hard, nursing is much harder. As far as Lindsey goes, yeah, there was a lot of God-given grace there. In a sense I was Isabella. I was with my mom until I was 6 and then raised by my father and stepmother. Both are “mom” to me and I love them both very much. It took a long time for me to realize how hard being a stepmother is to someone else’s child. It took me being a stepmother I think. Thanks for sharing with us today. I didn’t realize this book was about domestic abuse. Bless you for tackling such a tough but relevant topic. May He be glorified and others ministered too through it. Thank you Gina and Susan! Gina, I really enjoyed your presentation on promotion at the Roanoke Writers Conference. You shared a lot of great tips there and in this article. I particularly like how you embrace being different- encouraging us all to follow that inner voice and love what makes us us. Best of luck to you! Thanks for coming to my class, Julia and your kind words. I don’t always embrace what makes me different, but like most everyone, life is a lot happier when I do. This is really good, so happy I stumbled upon your blog tonight! I’m always looking for new authors, so thank you!